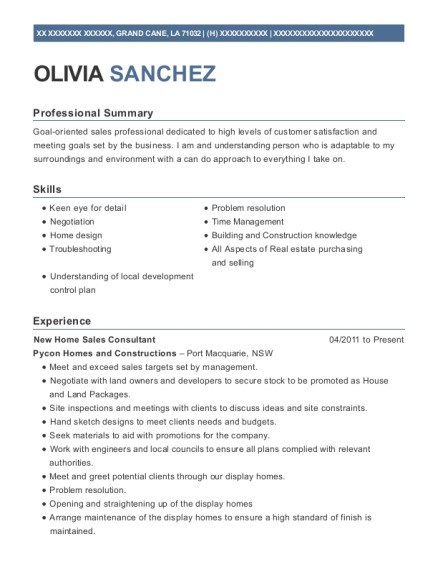 Experienced new home sales consultant utilizing effective sales, follow-up and closing techniques. Acutely focused on superior customer service and relationship building which leads to a highly motivated referral base. Maintain excellent rapport and consistent communication with purchasers to ensure a successful closing and customer satisfaction. Very ambitious and driven to meet or exceed sales goals. Seasoned professional that is results driven with extensive knowledge of the industry. Good working knowledge of mortgage programs and qualification guidelines. Highly ethical with a professional appearance and demeanor. New Home Sales Consultant Oct 1993－May 2013 GL Homes － Sunrise, FL Worked in multiple product lines consisting of multifamily, zero lot line and single family homes. Targeted purchasers included first time buyers, move up, luxury and adult only. Excellent ability at converting prospects to purchasers. Focused on company goals and needs. Received substantial recognition for sales success through company awards. Property Manager Oct 1992－Oct 1993 Gold Coast Property Management － Boca Raton, FL Desired to enhance my knowledge regarding the functioning of the associations and how to successfully manage the communities. Responsible for budgets, accounting, capital improvements, vendor coordination, maintenance programs and ensuring association compliance with Florida Statutes. New Home Sales Consultant Nov 1989－Oct 1992 Kennedy Homes － Boca Raton, FL Responsible for procuring and following- up on prospects. Guiding and advising buyers through the sales process. Accurately completing the contract paperwork in the appropriate time. Worked with single family and multifamily product lines. Responsible for completing the option and color out process. Economics degree has been beneficial in helping to anticipate, identify and analyze trends in the industry. Continuing education in real estate and extensive new home sales training. 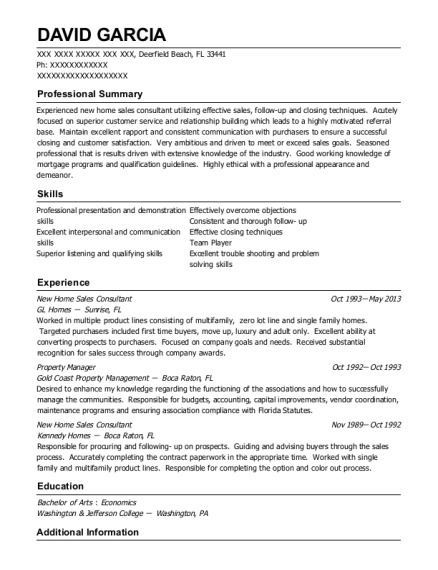 This is a resume for a New Home Sales Consultant in Deerfield Beach, Florida with experience working for such companies as GL Homes and Gold Coast Property Management. 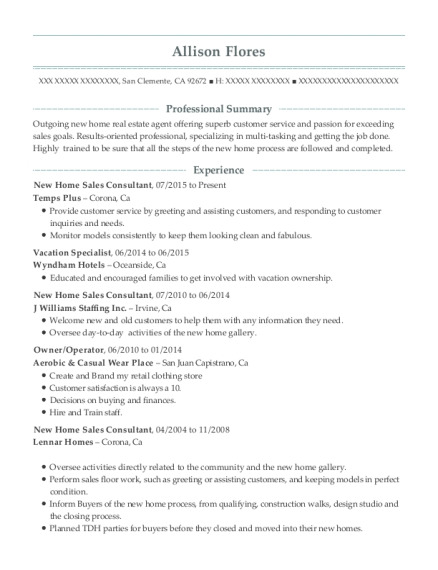 The grade for this resume is 0 and is one of hundreds of New Home Sales Consultant resumes available on our site for free. 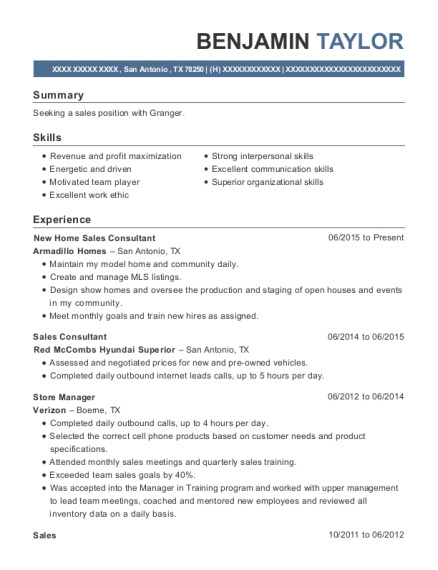 Use these resumes as templates to get help creating the best New Home Sales Consultant resume.